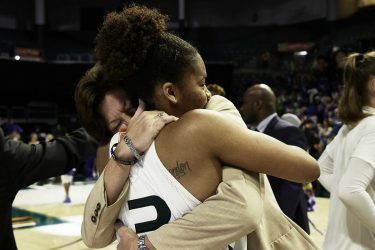 Miami struggled in the second half Thursday and fell to Virginia Tech in the first round of the ACC Tournament, 65-47, ending their run in Atlanta and likely ending their major post-season hopes. The Canes played close with the Hokies for much of the first half, trailing by four at the break. But a 14-0 run gave Virginia Tech a lead they would not relinquish. Senior guard Jack McClinton struggled on the day, scoring only nine points and going 1-of-6 from beyond three-point range. The one three-point shot he made marked the 33rd straight game in which McClinton has hit a three-pointer, a school record. 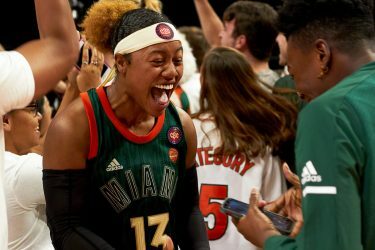 Miami now waits for Sunday for the results from the NCAA Tournament selection committee, although with the loss, it’s virtually impossible for Miami to be selected. It’s much more likely that Miami will be selected to participate in the National Invitational Tournament, or NIT. Miami last participated in the NIT in 2006, losing in the first round. For more from Atlanta and wherever Miami’s post-season may take them, visit Corey’s Stories at blogs.TheMiamiHurricane.com.